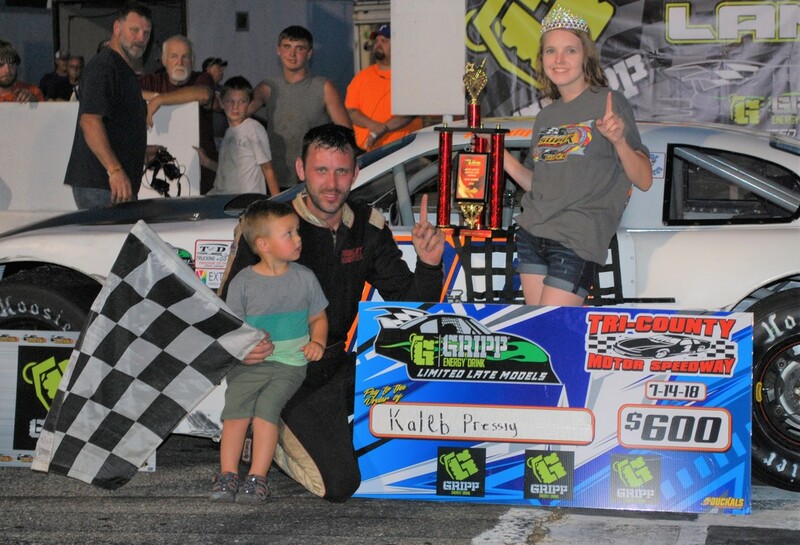 The Gripp Energy Limited Late Models entered its sixth race of the year on Saturday July 14. There has been three different winners in the first five races. Dillon Houser who has the most wins, of three was put to a screaching hault. As Mitchell Mote from Greenville, SC captured the win the last time the series visited Tri-County Motor Speedway. And five time Anderson Motor Speedway track champion, won at his hometrack AMS the last race out. So as the teams invaded Tri-County for the third time this year, it was unclear who was going to walk away with the hardware. TCMS is home to a few of the competitors Dillon Houser, Chris Phipps, newcomer to the series Mark Goin, and 2005 Track Champion Josh Goble. Kaleb Pressley jumped into the seat of the #10O machine normally driven by Randy Ollis. The drivers climbed into their cars, buckled up and prepared to take on the rough, but exciting track. Houser was able to walk away as the fastest in the first practice round, with his team mate of Phipps in second, Pressley in third, Goin fourth fastest, and rounding out the top five was Goble. They had one more chance to make adjustments and practice. So the teams went hard to work, this time it was Phipps who clawed his way to the top of the charts over Houser in second, Pressley in third, Goble in fourth, and Jesse Clark in fifth. They went back to the garage area and headed to tech inspection, and lined up for qualifying. Taylorsville, NC's own Mark Goin who captured the Renegade Race Fuels Pole Award with a blistering lap time of 16.860. Goin rolled a five on the invert dice which now set Clark on the top spot with Pressley starting second. As the night went on, and it was time to shine, the drivers lined up on the front stretch to kick their race off. Clark followed the pace truck around the facility. As the flagman waited for the field to come off turn four, he gave the signal and Clark took off like a lightening bolt. However Pressley was not having any of it, he quickly went to work on the #5 machine of Clark and finally found his hole and dove under Clark to take the top spot away. Once Pressley got out front, he then had to hold off hard charging Phipps who was trying his best to get up front. The first caution flew on lap 13, as #4D of James Dolan and #5F of Phillip Faircloth tangled in turn four. Goble dove down pit road to the aide of his crew right before the incident on the track happened. As Pressley paced the field back to the green flag, the caution flew again as Goin and Tanner Brookshire got together on the track ending both of their nights. Pressley once led the field back to the green flag, this time it was Davey Smart who had been working his way towards the front of the pack. Smart dove under Houser to take over the third position. The third caution flew as the #2 of Ralph Carnes came to a hault in turn two. Pressley once again led the field back to the green flag, this time right off the get go, the battle for second erupted as Phipps was now having to hold off Alan Rich, Smart, and Houser. The field then settled down and went green the rest of the way with Pressley taking home the trophy. "I dont even know where to start, I gotta thank Randy Ollis for letting me drive this thing tonight, we just made this deal on Sunday night. He was ready to haul this car to the scrap yard, because he was upset with it and couldn't work the bugs out" stated Pressley in victory lane. The GELLM Series will be back in action on Saturday July 28th at a brand new track to the series, Caraway Speedway. So make plans now to follow your favorite drivers over there.